Posted 4 years ago , 42 users are following. I am 29 yr old healthy female and got this awful virus a month ago. started with two days of terrible fever ,chills, and sore throat. Day 3 :Blisters appeared on hands and feet. Two nights of no sleep due to extreme discomfort (feeling like hands were lit on fire) the whole time. My only relief was sandwiching hands between a large ice pack and occasionally soaking hands and feet in Epsom salt water.The doctor basically said there was nothing to do, but wait. Fabulous. She prescribed lidocaine for my hands, which I never got the RX filled. It gets better. I started to get these nasty tiny sores and discoloration by my nose that wouldn't go away from days 4-8. They just looked nasty. I was using diluted hydrogen peroxide mouth rinse twice a day to avoid canker sores. I had two canker sores on side of tongue that I would hit with direct hydrogen peroxide on a Q tip twice a day. This seemed to help. Gargling salt water kept sore throat at bay. I just kept taking Tylenol, but it didn't help a whole lot. I also started using organic virgin coconut oil on hands and feet at night.minread it has anti viral properties, but don't take my word for this. It seemed to soothe the blisters a little. The thing that helped most on day 4 was doing a 30 minute healing meditation twice a day. Calmed my nerves and then the healing process started kicking in. I really do think my body was too stressed out to know how to repair. I had a burn on my wrist from days before the virus and during the first 4 days it was infected. Almost like my body was attacking everything. The meditation seemed to start healing the burn by day 5 as well. I had to bandage my hands after day 10 when I returned to work. Lots of people,masked questions, I said I burned my hands. I delt with flaky and peeling hands for two weeks after and calloused feet. Skin on toes all started to peel off. Now a month later my entire skin of heel is dead and starting to peel off in large pieces. It's gross and pretty ridiculous. I want to let it peel by itself but have had to gently pumice and peel some of the areas. Just trying to keep it clean. One of my finger nails is slightly white by cuticle and I'm terrified it will fall off. this is a very nasty thing to catch and I have no idea how I even got it. I wish there was a vaccine for it. I am a 24 year old healthy male. I had a similar experience with HFM. I had the virus for a week without showing any symptoms (I know this because I know who I got the virus from.) I beleive my immune system was lowered from a trip to the beach: did a lot of swimming, walking, running, got a bad sunburn, and was cold the whole car ride home. Woke up the next day feeling sore, sunburned, and very tired (despite getting about 9 hours of sleep). Then in the evening is when my symptoms started showing: Bad headache, fever, and sore throat. Felt a bit better the next day untill the sores started to show up. They were notto bad untill the day after that. They became pretty painful and itchy all over my hands and feet. The main reason I am posting this is because I tried many lotions, creams and oils that did not help; I was contantly dipping my hands and feet in ice water to numb the pain/itching. BUT then I put some VICKS VAPOR RUB on my hands and feet and it helped a whole lot. Later I found some NATURAL DEET-FREE LEMON EUCALYPTUS INSECT REPPELLENT, sprayed it all over my hands and feet, and it helped even more! I hope this post will help anyone that gets this unpleasant virus to suffer a bit less. p.s.I have had poison oak about 4 times and this virus is like 10 times worse. 17 yo male, got HFMD, mouth and throat sores are the worst, they hurt A LOT when you swallow, or even drink water. Can't eat anything at all, and I don't know what to do. Yesterday sores were in throat only, now its in mouth too. Whats to come? Okay I'm on day 23 or24. I had swelling in hands and feet pretty significantly to the point where I couldn't use them without extreme pain. I also got a viral pneumonia as a side effect. So all blisters finally gone. Small temp still. Starting the scaling and skin slothing now. But it seems if I do too much meaning stopping at cvs, Michaels and giant within one hour all my aches and pains come back. Where it swelled on my leg is hurting again. I spent about one week in and out of er until referred to an infectious diseases doc who gave positive diagnosis with blood test. You'd think with the tons of blood they took at each er visit that they'd test for it. Question is how long did you suffer with any set backs. The doc gave me one month off from work. Said at the beginning it was gonna get worse before better and took me off all the meds er and primary doc had me on. Just Motrin for pain. Thanks!!! 16 yr old healthy female here. My 6 year old sister came home with this and it looked hella disgusting and I was so intent on not getting it, I was washing my hands every five seconds but alas here I am with it. Started on Thursday (Day 1), where I felt like walking death. Basically felt like I was coming down with flu, because I was weak and kind of nauseas. Later that night, I even got uncontrollable chills, and stayed home from school the next day. Friday (Day 2), went to the doctor. My throat hurt really bad. She takes one look at my hands, which are starting to break out and swell with tiny blisters and says "Oh you have scabies" and I knew damn well I didn't have scabies so I told her about my sister and she was like "oh well that's what you have" and then proceeds to tell me there isn't a thing I can do about it. Saturday (Day 3), Throat hurt a little, but not nearly as bad as it had been, hands got even worse, and by now my feet feel like I'm walking across hot coals with every step I take. For me, I have blisters on my heels and around my toes forming. Sunday (Day 4), I stayed in bed the majority of the time because my feet hurt like bloody hell. Couldn't walk more than a few steps because my feet were THROBBING. Seriously it's the worst. I woke up and found bumps forming on my elbows also. Still doesn't look as bad as my sister's case so idk. The blisters are all gross and are either kind of clear and watery or yellowish stuff. But they HURT. Now it's Monday (Day 5), staying home from school again because my hands are so swollen and blistered I can barely grip anything and can't even feel the screen I'm typing on. My feet are the worst. They hurt so bad. Here my sister is mostly recovered and I'm over here, like descending into hell. I've heard it's supposedly very difficult for adults to even get this and here I am with it sooo idk. Is this supposed to be over with quicker or not as bad as it is with kids or what? I need someone to give me hope lol. What is yet to come and when will it be over? This should be as bad as it gets and you will start to feel better in yourself although my spots lasted 5 weeks (although I'm quite a bit older than you). I found I was very tired afterwards and run down. Once the spots have gone your skin will probably start to peel on your hands and feet. Sorry there's no magic cure - you just have to ride it out and take care of yourself. Some things that are not obvious and I didn't read about right away when I had MFMD: You can get severe depression while you have HFMD. Some of your nails will be damanged but you only notice a few weeks after the disease. Your hair might also be damaged, especially if you have long hair, after 3 - 6 months you will notice an extreme amount of breakage! My hair stylist was puzzled and sent me to the GP to get blood tests to find out why half my hair was broken :'( Sadly it will take years for my long hair to be full again ... anybody else noticed that? Do you also have bumps on your scalp? My daughter contracted this virus from working at a daycare. She had the sore throat, blisters, couldn't walk due to the pain in her feet. About 6 of her fingernails are going to fall off. It is about 4 weeks since her initial onset of this. I can't explain what is going on with her scalp but thought it might be connected to the virus. My bumps on my scalp occurred at the same time as the hand and foot blisters. I'm a 15 year old male. I thought it was strep so I started to take a antibiotic for it 4 times a day. I had extremely painful soar throat but it was about to get worse. I sill thought it was strep but my body was tired and I couldn't sleep. No bumps on my hands/feet yet. But my hands were soar. I could not eat or drink without having pretty bad pain in my throat. Then my tounge became covered in white patches along the side and it felt like canker soars but hurt really bad. I woke up with horible pain in my throat and mouth. My hands are covered with red dots. Some larger and others but all hurtin alot. My feet however only have a few small dots. 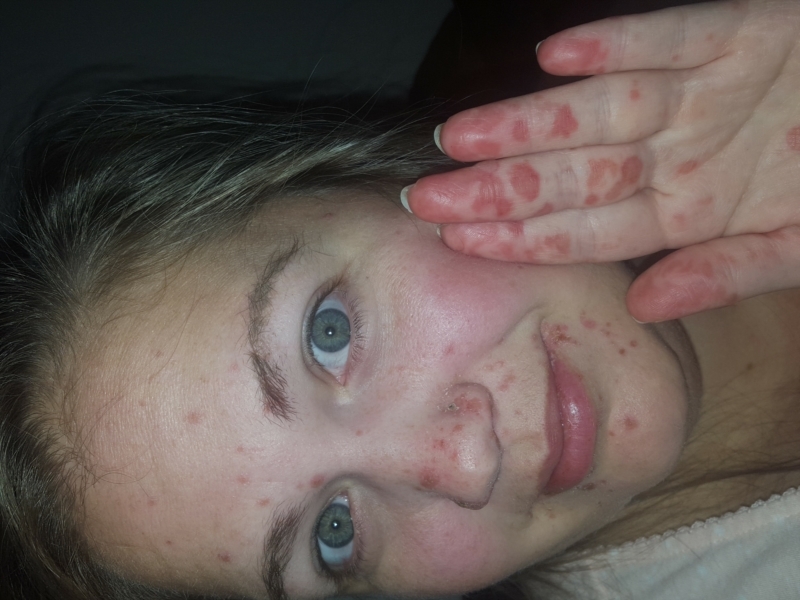 -I'm afraid I may have HFMD and would like to hear anyones feadback to what this may be. I'm leaning toward yes for the hfmd. I did not have any issues in my mouth except for the terrible soar throat. But the little red bumps on hands and feet are very much an indication. My 13 month old son contracted HFM from daycare. He had a fever one moring, the fever broke, then he had blisters on his hands, feet, mouth, and diaper area. Aside from the initial fever, he was a champ and acted like the sickness didn't bother him at all. Fast foward 2 weeks and I wake up on a Wendsday feeling weak and tired. I get to work and force myself get out of the car and go inside. I have a raging headache, my throat hurts, my body feels like I was in a car accident, and I'm freezing cold. I pop 3 Tylenol and go lay down in one of our break rooms and fall asleep for about an hour and a half. When I woke up, I could tell my fever had broken and my headache had eased up, so I felt somewhat better. My throat was still hurting, but I stuck it out at work. I noticed a couple of little spots on my palm that were a bit itchy, but tried to ignore it. I went and picked my son up from daycare later that afternoon and when I got home I was feverish again. I took more medicine and l covered up and laid down and once my fever broke again, I started feeling a bit better, but again, my throat still hurt. That night, I couple of more spots popped up on my hands and and a couple of really sore and itcy spots around the rim of my nose. I slept ok that night aside from my sore throat and my hands bothered me a tad, but not much. I woke up the next day and took my son to daycare and realized that that was the beginning of the end. I went and got a smoothie because my throat was so sore it hurt to swallow anything else. Then, my hands went completely down hill. More spots were popping up by the second and they started itching and burning. That night, I didn't sleep a week. My hands were excrutiating. I had to hold frozen water bottles just to get releif. I got up the next morning and my feet starting itching and burning as well. That's when I found my heavy duty meds that I had left over from my c-section a year ago. I took those and a ton of benedryl and was able to sleep a bit. It went steadily down hill until Sunday, when finally, things started subsiding. My picture is from Monday, day 6 of HFM. That's when I was feeling good! I looked like a leper and worked from home until Thursday because I wanted to make sure I wasn't contagious. My hands started peeling last Friday, and today, 2 weeks after everything began, they are finally starting to look a bit better. I just carry around nail clippers with me to clip off the peeling skin. This has probably been the worst I've felt in my life. Being in the midst of it was almost more of a mental struggle than a physical one. That being said, if you get this, go to your doctor and ask for heavy painkillers. They'll make you space out enough that you won't go jump off a bridge. PS - I can't wait to see if my fingernails fall off! HFM - the gift that just keeps giving. I've had HFAM for 5 days. 2 days of horrendous itching on my hands, now they're just swollen and a bit numb. My hands are covered in spots and blisters. Have it on my feet too but they haven't bothered me as much. Also have spots on my face, which are starting to dry up. My mouth and throat have been agony and I have barely eaten for days but today I got some really good painkillers so I feel myself at last. A few questions from fellow sufferers! Reading this thread is filling me with fear of future bouts and losing my fingernails. Are there people who have not suffered from this? Just had one bout and so far, nothing more? Does anyone have any advice or thoughts on how to avoid it coming back or to prevent further problems such as the fingernails? I suspect I'm grasping at straws on that but worth asking in case anyone has heard anything. Also does anyone know if and when you should apply moisturiser to your skin? It feels so dry but I don't know if that helps it dry out, or if moisturiser would just help it spread. I'm praying I'm on my way to recovery now, and have at least escaped a fever. Been to several doctors but there was a lot of conflicting diagnoses of Scarlet Fever and Strep. I caught it from my 10 month old son, who recovered quickly. Although he had antibiotics as the doctor thought it was a bacterial infection. Very confusing! Anyway, would love to hear any positive outcomes and tips. Thanks so much, nice to know we're not suffering alone. It took the doctors over a week to diagnose me. They thought it was strep, and then they thought I was allergic to the antibiotics, etc etc. The first thing that helped me (and you might be past the hands just burning stage but) I bought bags of frozen peas and fell asleep holding them very night for probably about a week. Once the spots on my hands started to dry out (they got a darker red / brown in color) I started moisturizing my hands like crazy. I bought a pair of "spa gloves" from Walgreens, they were lined with silicone I think, so the lotion just stayed until my hands soaked it all up. I tried aquafer and a ton of other "body cream" or whatever else I had, but I had the best luck with aveeno baby lotion with oatmeal. Expensive, but totally worth it. I don't think there is any you can do to avoid losing the nails and I think I've heard as long as you get a "bad enough" case, you won't get it again, but who knows. It was a slow process of getting my hands back to normal, but they stopped peeling and blistering and hurting eventually and got back to normal. Hang tight, you'll get through it!! It seemed to me that any lotions or moisturizers didn't help until the peeling started. I would also recommend the aveeno eczema care or gold bond heeling. I'm not sure there is anything you can do to prevent the losing of the nails. Like teragram said, it's just a little tender. I would wear a bandaid over the tips so they wouldn't catch on anything. You will get through this, and be stronger for it.